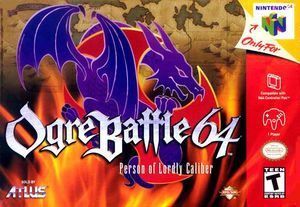 Ogre Battle 64: Person of Lordly Caliber (オウガバトル64 Person of Lordly Caliber Ōga Batoru Rokujūyon Pāson obu rōdorī Kyaribā), sequel to Ogre Battle: The March of the Black Queen, is a real-time strategy role-playing video game developed by Quest and published by Atlus for the Nintendo 64. The game is real-time strategy role-playing game based on tactical RPG concepts. Magnus, the protagonist, commands a battalion of up to 40 troops. Members of the battalion are sectioned off into units, by the player. Units are deployed throughout the map, and do battle with other units. Combat is performed in "semi-real time", with multiple characters attacking at once. Ogre Battle 64 was released to the North American Virtual Console on March 29, 2010. It was the first third-party N64 game available on the North American Virtual Console. The graph below charts the compatibility with Ogre Battle 64: Person of Lordly Caliber since Dolphin's 2.0 release, listing revisions only where a compatibility change occurred. This page was last edited on 6 January 2018, at 10:44.